Apologies for the slightly late mystery object this week – blame Dara O’Briain, who I went to see in Hammersmith last night. This week I have another specimen that came from the mixed box of bits for you to identify. 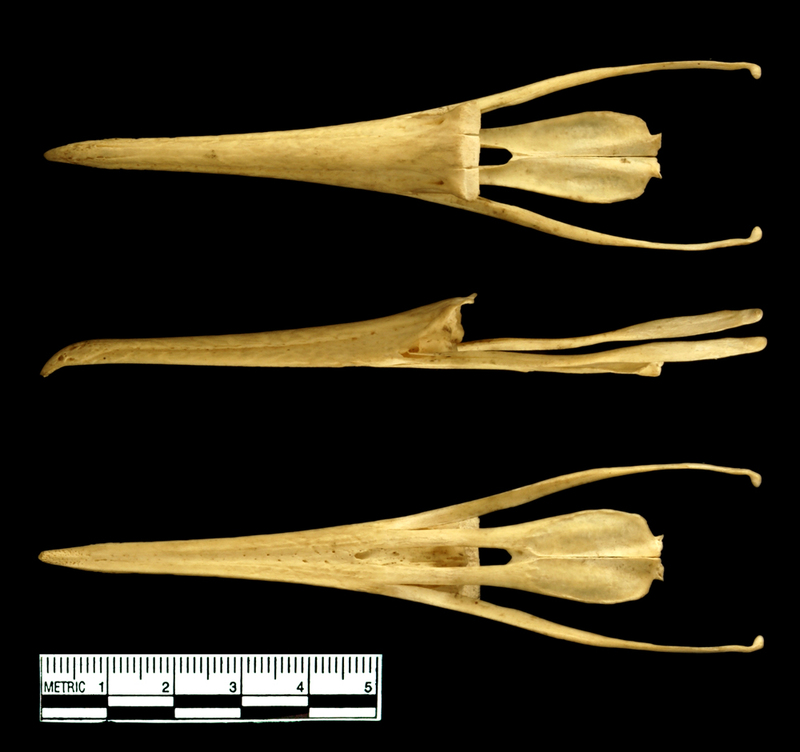 Any idea what this beak is from? As usual you can put your comments, questions and suggestions below and I’ll do my best to respond. Good luck! I think it is in the Phalacrocoracidae family. Am I right? The nearest match to my collection is P………… a………. but then I spotted that the bill might be narrower. Hi Mrs Powell ! I think P.a. as well. This is a distinctive beak! I’m pretty sure I’ve seen this beak watching shoals on the coast at Minnis Bay. Ph*l*cr*c*r*x s*lc*r*str*s would be my guess. Anyine remember Graculus from the old Oliver Postgate / Noggin the Nog cartoons? On another issue, where do you get your little metric scales from? I heard possibly NHBS, but can’t find ’em on their website. The scales I use are ones I adapted from stick-on ones I got as part of a forensics photo documentation kit. Here’s a site with the kits: http://www.crimescene.com/store/index.php?main_page=index&cPath=53 but you can usually find the individual components of the kit available through ebay, with a bit of searching. Yes! I loved Noggin the Nog! The Ice Dragon, Groliffe, was my favourite! I’m assuming that’s not a cryptic clue for the Alpine Chough? It would be very cryptic! Apologies for dragging the thread offtopic twice, earlier! Ok, my guess: Ph.. c..
Hmm, there are several species that could be Ph.. c.., but I’m guessing you mean Phalacrocorax carbo?